If there is one dessert that reminds me of my childhood, it is this one. These spiders made it to every holiday event, every family dinner, whether it was summer, winter, spring or fall. In the summer, they would melt all over the place – but they were still delicious. I had no idea how ridiculously simple they were to make until I made them myself after I graduated from college. 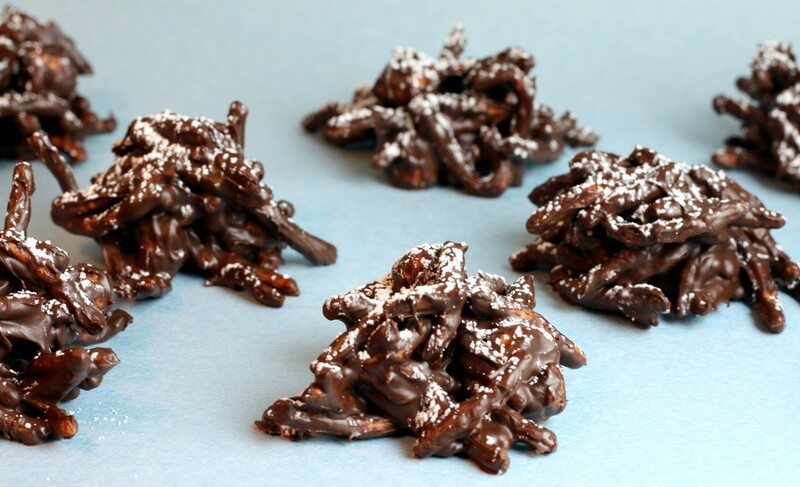 I have seen people make these with half peanut butter chips, and half butterscotch chips as well – I’m sure they are just as good – although I prefer the pure version – just semi-sweet chocolate chips. This is my grandmother’s recipe – just one of many I hope to publish on the blog. It is only fitting that this is the first of her recipes to be posted. 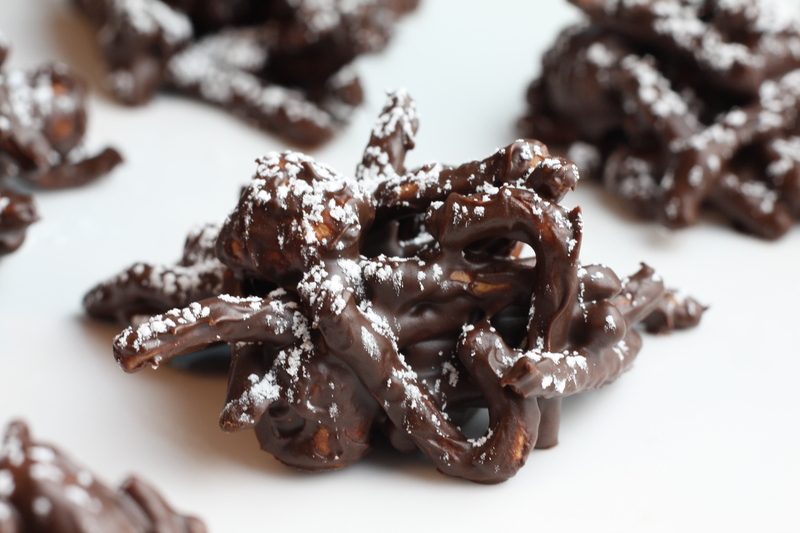 Melt chocolate using a double boiler over medium high heat (or microwave in increments of 30 seconds) and gently fold into noodles and marshmallows until noodles are coated. Spoon onto cookie sheet lined with waxed paper and chill until set. Freeze. Defrost 5 minutes. Sift on confectioners sugar and serve. After they are frozen, they can be stored in a plastic bag in the freezer. Do not sift on confectioners sugar until you are ready to serve them. How lovely–my grandmother made these as well, so thanks for bringing up the memory. But she added peanuts rather than marshmallows. And they are wonderful–too wonderful for me to have in the house! Took these to a cookie swap last night and they were a big hit! Hi Dawn…This blog is absolutely delicious! I frequent it often, but it has been the center piece of our activities this wknd, as we are all home together force feeding Grammy (Aunt Ronnie) anything that will mask the taste of Flagil! Thanks Sarah! I hope Aunt Ronnie feels better soon! !